At Shenfield High School we have a dedicated faculty who nurture and encourage their students to achieve the very best results in Art. "I'd live in the Art Department." In Key Stage 3, Year 7 to 9 to focus of Art teaching is on the basics. 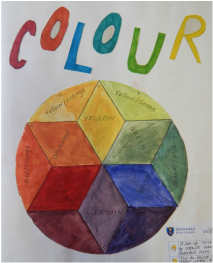 Most pupils come to High School with no training in Art, whatsoever, so the first order of business is to acquaint them with an understanding of the formal elements of Arts; line, colour, texture, tone, shape, form and pattern. This is achieved through a series of projects which are fun and also stimulate as new way of seeing the world. Those who choose to take Art as one of their GCSE options will have to work hard. The higher levels of Art are not for the meek. There is a large volume of work to be produced and a high level of understanding and skill is expected. Work produced at GCSE needs to show development in skills and thought processes to express an idea. At A-level Students are expected to be very independent learners, exploring many different artist’s genres, techniques and disciplines.